MANILA – (UPDATE2, 7:23 P.M) In a rare confluence of occasions, President Rodrigo Duterte and Vice President Leni Robredo – who resigned her Cabinet post last year amid intramurals between pro-Duterte groups and the Liberal Party where she belongs – found themselves together at events three times in four days, prompting the irrepressible President to turn on the charm despite their political differences. At the start of his speech Wednesday at the commencement exercises of Philippine National Police Academy’s Maragtas Class of 2018 at Camp General Mariano N. Castañeda in Silang, Cavite, Duterte made an obvious attempt to slowly pronounce, for emphasis, the full name of his VP: “Maria Leonor ‘Leni’ Robredo” and then joked, “this is the third time that I have greeted you, my lady,” drawing applause. 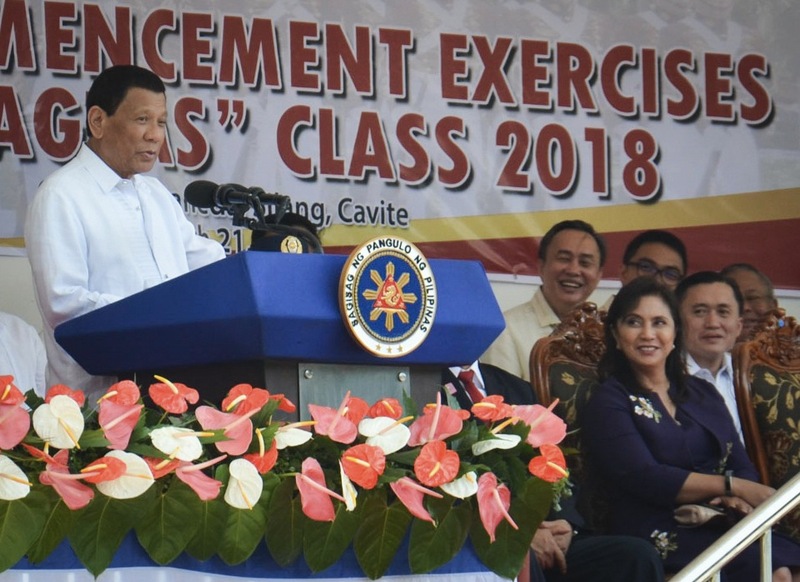 He then noted that it’s the third day they have been together, starting with the Philippine Military Academy (PMA) on Sunday in Baguio City; to the 121st anniversary of the Philippine Army at Fort Bonifacio on Tuesday; and the PNPA graduation. 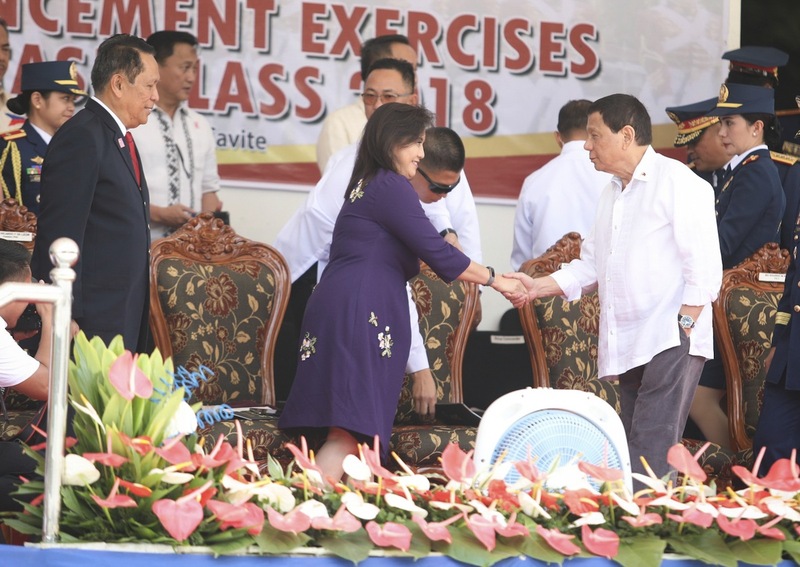 Earlier at the Army anniversary on Tuesday, Duterte had apologized for being late, saying the Cabinet meeting had taken longer than usual and then looked in Robredo’s direction and addressed her, saying the meeting lasted long because they talked about her. “I’m very sorry I’m late; kasi late natapos ang aming Cabinet meeting, ma’am, ang pinag-usapan namin, ikaw.” This drew a smile from Robredo, who in the past had made critical comments about extra-judicial killings tied to the war on drugs. 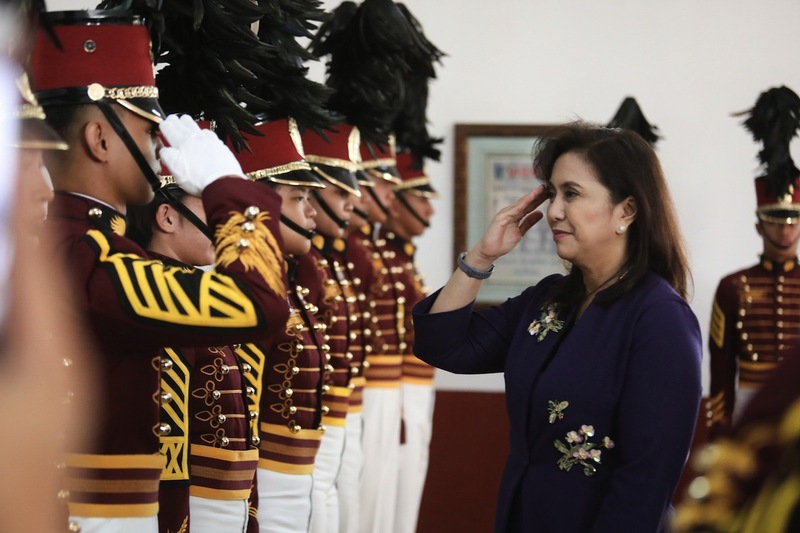 She recently said Chief Justice Maria Lourdes Sereno deserved due process amid efforts to oust her either through impeachment or through a quo warranto petition, or pressuring her to resign through calls from stakeholders in the judiciary. The charm episode during the salutations at his PNPA speech on Wednesday did not last long, though, as Duterte repeated yet again in his speech proper his disgust at critics of his war on drugs, saying he had promised to wipe out the scourge during his 2016 campaign, and was determined to do just that. Duterte also explained why he had arrived late at the PNPA, saying he had last-minute discussions on the pending Philippines-Kuwait labor agreement that is hoped to end a trend of abuses against overseas Filipino workers. Before their commencement rites at Camp General Mariano N. Castañeda in Silang, Cavite on Wednesday, VP Leni Robredo met the Top 20 graduates of the Philippine National Police Academy’s Maragtas Class of 2018. Class of 2018’s topnotcher is Police Cadet Fritz John Vallador of Kabankalan City, Negros Occidental. Photo below, also from OVP. Troop commander, could you give the order of tikas pahinga to the troops? Iyong una sa PMA in Baguio, then Fort Bonifacio kahapon at dito ngayon. Sana po may graduation pang iba para magkita pa rin tayo. [laughter] I love to see my Vice President. Interior and Local Government security-in-charge Eduardo Año and the other members of the Cabinet; Dr. Ricardo de Leon, president Philippine Public Safety College; Police Chief Superintendent Joseph Adnol, Director Philippine National Police Academy; officials, enlisted men, personnel and civilian employees of the Philippine National Police; the Cadet Corps of the Philippine National Police Academy led by the “Maragtas” Graduating Class of 2018; other distinguished guests; ladies and gentlemen. Just relax, it’s 2:30, I’ll be through by four. [laughter] Kumain na kayo? Pareho tayo. Ako sa totoo… Honestly, I was late because we were working on the final draft that will be brought to Kuwait by Secretary Bello and I added some requirements. That they will be fed nutritious food. And that I will not — we will not allow leftovers to be eaten by our countrymen. Palutuin sila ng kanila. Then there will be no confiscation of passports by the employers. [applause] If at all, it will be surrendered diyan sa table sa arrivals of any country where the Filipinos are working in numbers. And fifth is that they should be allowed holidays and everything. Eh nagmamadali sila. I do not mean to offend the — all, for employing Filipinos abroad. I have said that we are not slaves. Maybe your only fault would be in your country because mahirap lang kami. But I reminded them also that in the so many wars in the Middle East at the behest of the Americans, I don’t know why, at eh kung may mga expeditions sila. For example, the Iraq war of Bush, the first and the second, they always demand that they participate in the expeditions. The last time I remember na we sent about 702 suffered casualty of about — no, 702, yes, tatlo ang medyo ewan ko but maybe there are still around wounded. Ang sinabi ko we — it is a two-way affair. Pero I’d like to remind you that ito ba ang ibayad ninyo sa amin for fighting in your country? Ito ba ‘yung makukuha namin? Pero ang sabi ko kung ganito lang… And I’m addressing America right now, whatever expeditions that you will conduct, any wars that you will fight in any other countries, count us out. Wala kaming nakuha all these years of sacrifice except brutality and agony. We will stand on our own. Maski wala tayong pera, pilitin kong mag-imprenta ng pera, tag-limang sako lahat tao. [laughter] And we will never beg for any help. Sometimes it could mean really the dignity of the people. We have been enslaved by two countries in succession — Spaniards for 400 years and the Americans for 50 years. Tama na po ‘yon. You have had your fill, do not ask for more. Hindi din libre ‘yung pagpunta ninyo dito. You stole our natural resources, you stole the oils of the Arab countries, divided it arbitrarily into a nation at ngayon kumukuha pa rin kayo, hinihigop pa rin ‘yung oil and there is trouble everywhere. So kung ganun lang naman unless we are threatened directly, there will be no more joint expeditions. At least sa panahon ko. Maghintay kayong lahat kung mawala ako. I’ve been mayor of Davao City for 23 years. So my rapport with the police is a little bit closer doon sa Army because the police is under the supervision of the mayor. So kind of over the years I have a good grasp for the — or dimension of — ‘yung lahat na, the persona of the police. Now remember that there are a lot of fighting going on outside of this ground. I lose three or four policemen a day throughout the country. Kaya nung nagtingin ako sa graduates ngayon sabi ko medyo kulang ito. We will not be able to satisfy the requirements of officers to police the police kung ganito lang kaliit. And remember that kami, we are getting old, you are the bridging generation. Ako after three years, alis na ako. I don’t know who would be the next president. But certainly matanda na ‘yan. But if the Vice President wins, then you will have a beautiful and a young president in this country. Ngayon, I’d like also to remind everybody that we are a one nation. That not all the Moro of Mindanao are our enemies. So maybe next time there should be a percentage of the Moro people joining PMA or the PNPA. We need them. As a matter of fact, kailangan talaga natin sila. And I have seen with my own eyes the experience in the so many battles including Marawi. Many of the Moro people who were soldiers were there and many died for our country. So we cannot govern this country by just selecting from the other provinces without looking towards Mindanao. And we need officers trained and we need to work with them in Mindanao. At isali naman natin sila. Not only the Moro. But as a matter of fact, it should be divided among the tribes, Ilocano, Bisaya. That’s ought to be the Philippine National Police. I hope by the next batch or the next — the one coming up for this generation, I will have the money to give you to enlist more police officers. To the graduates, I extend my heartfelt — ganun rin. [laughter] It’s plagiarism all over again. I’d like to just point out three things. Bantay kayo kasi the sparrows are very active. Kayong may mga baril, be sure not to display it, and be sure to keep a low profile. And if you enter a place na hindi naman kayo kilala, keep a sub rosa style of movement. We are at a war. Now, itong mga NPA, mainit talaga ‘yang baril. Well, in Davao, I don’t know if Inday has been able to continue with the practice. Sa Davao, pwedeng magdala ng baril ang pulis, ‘yung handgun but never ‘yung mga high-powered firearms. Maglalaway ‘yang mga g*** eh. Tumutulo talaga ang laway. Eh tayo magtulo man lang ang laway natin sa babae. [laughter] ‘Yung mga g*** na ‘yon, basta makakita ng bakal, M-16, M-14, kukunin talaga ‘yan. And I have commissioned one — kasama ni Rod de Leon noon, si Colonel Estares. He used to be the R2. I have been commissioning him to go around the country, together with some former NPA rebels who were commissioned into the Philippine Constabulary and the Philippine National Police. Pag-aralan ninyong mabuti ‘yung style of assassination. Kahapon, dalawa. I think it was a husband and wife, who went to the bank to get some money. Paglabas nila, sinundan sila sa carinderia para ata kumain at pinagbabaril ‘yung dalawa. Please, presence of mind always. And as of now, by the law of averages… I am not condemning you to death, I am just saying, keep a low profile, heighten your sense of awareness. At kung makita ko medyo alanganin, if you are not sure, pagka bumunot barilin mo na. Eh kung bumunot ng panyo, magbili ka ng bagong panyo, ibigay mo doon sa kanya. Early on sa Davao, nandiyan si Bato. Alam mo ‘yung mga — ‘yung ever since the human rights came into being, wala mang problema ‘yan. Bakit ka naman gagalaw ng inosenteng tao? I mean, why do you have to kill somebody or molest, disturb anybody kung hindi naman ang — may kasalanang ginawa ‘yan? Unless you are a son of a b**** and ‘yung mga abusado, oppressive ang character, but those are not really, truly, true-blue, full-blooded policemen. And diyan rin ako talagang galit. If you want to know what will happen to you, eh ‘di tanungin mo si Bato pati ‘yung dumaan sa Davao, talagang istrikto ako. Pero ito ang masasabi ko sa inyo, just perform your duty in accordance with the law. Trabaho kayo. And if there are events that would occur, intended or not intended, for as long as you are in the performance of duty, do not be afraid or add stress on your persona. Ilang beses ko na sinasabi ‘yan na do not worry about cases kasi ako fiscal for eight years. Noong nag-mayor ako, sa katagtagan ng droga, maraming umalis na pulis, lumipat dito sa Maynila. Alam mo, kung nasa undercover ka, you’re with the intelligence at malaman nila, they will just take a picture of your wife going down or sumasakay ng sakyan. Then, maybe your wife and child, pagsundo niya pi-picturan nila ‘yan, ipapadala sa iyo. ‘Yun namang mga pobreng sundalo, “Sir, wala man kaming pera maka — madala namin ‘yung pamilya namin to a new place.” Or even — some are wont to do, bring them to America while the fight is going on. Alam mo, sa totoo lang, ayaw ko lang… I intend to insult them eh, but I do not want to do it. The only way na pag naka-demanda itong mga unggoy na ‘to, the only defense available to them, especially if it is true, is they will file a countercharge. Alam mo pagka ang pulis ‘yung ordinaryo, the day that he is suspended, he loses the money. Wala ng pagkain ‘yan sa lamesa, wala na ‘yang pang-enroll sa mga bata o pamasahe sa eskwela. ‘Yan ang hindi alam ng mga p***** i**. Kaya ganun, karamihan sa mga pulis maghingi ng tulong. And they tend to gravitate to politicians. Eh may utang na loob, ‘yun na. It’s because it’s the practice eh. Walang mga pera ‘to and the command does not have enough lawyers to be there during the trial. So kaya ang pulis nahihirapan talaga. Either because of sheer fear of losing the income for the family or of losing his life. Kaya karamihan, the highest… Itong shabu, maraming pulis namatay. In Marawi, it started with a police punitive action. They were serving a warrant there inside Marawi, pagpasok nila, pinapakpakan sila ng heavy gunfire. So they had to call the Armed Forces, pumasok ‘yung nine Marines the following day. Look what happened, eh ‘di massacre. Because they were there and they were able to position themselves in the buildings, in the windows, and they have perfected the art of sniping. Ang cover nila semento pati bakal. Ang pulis ko pati sundalo ko gumagapang. And even when crawling, easy target. That’s why I lost so many men. Itong mga human rights, ang akala nila lahat namatay doon lang sa… Then how about my policemen? They are… They number into thousands already and yet we’re not — hindi pa tayo nag-umpisa ng trial nito about that ICC. Tapos that’s an old issue sa — nag-umpisa sa election actually. Ang issue sa akin, babae pati patay. On both counts totoo ‘yun. [laughter] L****. Para ‘wag na tayong mag-drama. When I was mayor ganito. Look, criminals and all, I am not a policeman, I am not a military officer. I’m just one who has been chosen by the people to build a city. Do not destroy my city. Do not destroy our young because if you do, I will kill you. Kung hindi pa naintindihan ‘yang mga p***** i***** ‘yan. [laughter].When I became President, same. If you destroy my country, I will kill you. What is wrong with that statement? What’s the f*****…? If I say that you destroy the youth of the land, where is the wrong there? 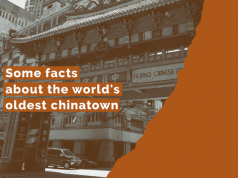 I never said, “you kill Mr. Chua, Mr. Lee, ‘yung iba.” Like the mayors in the Philippines who became filthy rich, built houses using P500 bills. I’ll mention it to you Parojinog. He was running the show in Western Mindanao. The revolution, the siege in Marawi was funded by the so many drug… Western side, it was Parojinog. Well, pasensya lang ako because we were friends. Noong mayor ako, kaibigan man kami, eh ‘di sige. And every time he goes to Davao, ‘yung alimango kasi ng Ozamiz malalaki at mataba. Magdala ‘yan siya ng isang sako tatanggapin ko rin kasi masarap. Pero ito matanong ninyo sa mga mayors ninyo and even the city mayors here. Tinawag ko sila. Kasi ‘yung ibang mayor — Espinosa pati si Parojinog, they were already killing their own policemen who would not cooperate with them. So tinawag ko sila sa Malacañan. Lahat sila. Tanungin ninyo ‘yung mayor ninyo. Now, if you do over things, I will take care of you. Totoo naman tayo. Wala mang problema ‘yan. Namatay, patay. Alangan. Eh sila eh, eh lumalaban eh. Millions because of the drug money and he corrupted all of the police, policemen there in Ozamiz City at ‘yung ayaw pinagbabaril nila. Kung ikaw ‘yung mayor, maligayahan ka? Would you be happy? Eh mahirap ‘yang ganun eh. I have a duty to perform and I will not hesitate. Kaya kayo sinasabi ko, “I will protect you” because my experience is takot ang pulis baka magka-kaso. Pati ‘yang bata. Alam mo pag hinuli na ‘yang bata, magkisi-kisi ‘yan eh. Ayaw talaga ng bata magpahuli eh, dudumugin mo pa. Minsan magkakaroon ng mga he… So pag nakita ng — “napano ka?” Eh ginanun ako ng pulis. Eh natural. Because the law of arrest is you must arrest the person and if there is a resistance assuming it is a lawful arrest, you have to overcome the resistance. Kaya ‘yang mga lasing kung paghuhulihin, lumalaban, sipa dito, sipa doon, eh ‘di mabugbog talaga ng pulis. Ito namang mga ugok na ‘to, itong mga p****** i** na ‘to, ‘yan ang ibig kong sabihin. They are so blind na ayaw naman pakinggan basta ‘pag nakita nilang may injury diyan, I just hope that they would become mayors or president someday. Ngayon ‘pag si Trump, sabi ni Trump, “Okay, Mayor Duterte, Rodrigo, you are good. I will follow you.” [laughter] P*** anong [applause] anong… What kind or which is which of the values that you’d want me to educate? Pasundin mo ako sa ganung klase na… Tingnan mo si Bato. Early on, tuktok. Anong sabi ng human rights, p****** i**, eh bawal ‘yan. Bawal sa human rights. Now recently, America was able to seize a dark web. Doon ‘yung distribution ng online. Nakuha ng security guys. Sila ‘yung nag-operate, sila rin ang nag-deliver. So what happened? ‘Yung hinog na, t*** i**** mga Amerikanong ‘to, u***, sinunod si Bato. Kinatok rin nila ‘yung lumabas sa computer. And I remember. You read Time magazine March 5 issue. It’s about opioids, heroin and everything. I hope that you, media, you remember. O kita mo. From page to page, one issue dedicated to drugs. How many persons are dying in America? Time magazine, March 5 issue. They are killing 63,000 people a year. Eh ‘yun ang… ‘Yun ang hindi nila naintindihan. I hope that these guys — do not vote for them. Kayong mga military pati police, iwasan ninyo ‘yang mga taong ‘yan. Nandiyan lang ‘yan sa Senate, puro arte, puro criti — wala namang ginawa and ayaw nila tayong intindihin. We are facing the drug front. We are facing a secessionist movement both sa insurgency, Muslim, pati ang NPA. You know, hindi na ako makatakbo. I cannot… I may be even… Wala na, tapos na ako eh. I would say I’d be worthless. But you soldiers and policemen, remember those who kept, who have kept faith in you. Iwasan ninyo ‘yan sila. Walang gagawain ‘yan kung hindi to bring trouble to the country by putting you in parity with criminals. Kaya sabi ko, “no way. No way that you will acquire jurisdiction over my person not in a million years.” [applause] At hindi ako papayag. I cannot renege kasi kung lahat, kung papayag ako, kayong lahat pulis nagtrabaho, eh sadya man o hindi, ipalagay na nating merong ano, extrajudicial killings. Halos lahat ‘yan. Mahirap ‘yan but believe me I am brighter than them. The issues that I raised is really nandiyan lang. That no person shall be deprived of life, liberty or property without due process of law. Kasama tayo diyan sa due process. What is the due process diyan in relation to the ICC? Publication of the law. Basahin mo ang treaty. It talks about a court, criminal court, then there is a chapter about prosecutors. Then the third is the ways of committing genocide. Wala ngang extrajudicial diyan eh. Pagka ganun, and the fourth, the definition of crimes and penalties, it is purely a criminal international law. Now sabi ng Supreme Court, kung hindi naman tanga itong mga g***, eh ‘di basahin na lang nila ‘yan. “Sir, hindi ko kasi alam ang batas eh.” So what is the mechanism that would change the story? It’s the publication. When it is published in the Gazette, it now puts you on notice, at least constructive notice na may batas even a treaty or a law or what, whatever, lalo na kung may pressure. But just because it is a treaty, it binds us. Loko-loko ba kayo? Sabi niya, “because a treaty need not be published because it is immediately effective.” P***. Ikulong mo ako without due process of law? Anong due process ‘yan? No person shall be deprived of life, liberty or property without due process of law. What is the due process involved here? Publication. So that you will be put to notice kayong lahat pulis na may batas. But they never published it. Sila-sila lang ‘yan sa Senate, ‘yung Presidente nagpirma at ipinadala kaagad sa Rome. I never read the law. I was a mayor then. Wala akong nabasa. I was not put on notice. It is a legal excuse? Yes. Eh bakit ‘di ko gamitin? Napakabobo ko namang abogado. You know, I was, as I said I was a prosecutor for eight years. I was doing trial work. The first thing that I would really do if I hold a case either for preliminary or sa — do we have jurisdiction? Does the court have jurisdiction? Then the next query would be, does the court have jurisdiction over the person of the accused by arrest, surrender or inside kasi walang bail or on bail? Then arraign. That is the time that there is jurisdiction. Eh kung walang publication, there is no law to be talking about. What is the basis for continuing an investigation if the law that you are relying is flawed and it is a total alien to us? Simply the Supreme Court said it. Ngayon, hindi ko na — matindi ang away natin. If we give in, we are fighting I said, the NPAs. Remember that I have already… I am about to complete or I am completing my promise. Corruption. Maaasahan. Marami na akong kaibigan pati ‘yung mga nag-campaign, ‘yung sumama sa akin 1988. Then I said I will finish the drugs. I will finish the drug problem before I get out. Kawawa. If I renege, it will compromise this generation and the next generation. Uubusin ko talaga ‘yang mga y*** na ‘yan. Uubusin ko ‘yang problema. The third. I’ll talk to the enemies of the state. I’m doing it with MI, MN, and I was talking to the NPAs. Now, itong mga NPA, kung nakikinig kayo, isa rin kayong bobo. Because we were having talks and in our way, all their notes, ‘yung magkabilaan nakukuha ko. Their notes mga NPA, pati ‘yung notes ng government panel. Paano ko kinuha? Hindi ko sabihin sa inyo. So I was summing it all, the total sum is they wanted a coalition government. In this country, the one that holds the sovereign power is the people. But marami — milyon tayo so we can all meet by representatives. So they have the Congress, the House of Representatives. Then dito sa ibang powers, distributed sa Supreme Court. But if you want to hold sovereign power, the important fundamentals there, you must be elected by the people. Eh kung gusto mo lang ng coalition government, diyan sila sa kabila, tayo sa kabila, ah anak ng… Sorry. So that you should be careful because we have a very toxic enemy. I don’t mind losing the guns. Marami pa namang baril mabili. But losing… Alam mo adre, sa totoo lang, lugi ang gobyerno sa inyo. You retire at the age of 56, that’s too early. Huwag kayo — do not be offended, kalaki yata ng gastos ko, ng Pilipino tapos mag-retire lang at the age of 56. Hindi ako makabawi. Remember ha. Sparrow, sparrow, sparrow, sparrow. Ang namatay ko na pulis pati sundalo in connection with drugs sa Mindanao, lahat-lahat kayo, mga 1,000. Kahapon mag-asawa. Do we do that? Kayong mga human rights, ginagawa ba ng gobyerno ‘yan? And would I ever allow it? So before I — I’m going home actually. I have a document with me. Presidential Pardon, ito ang hinihintay ninyo. [laughter] Puro makasasala. Hindi ko na mabasa. Maragtag [Maragtas] — at makakasalanan, marami dito o.
I, Rodrigo Roa Duterte, President of the Republic of the Philippines and Commander-in-Chief, hereby pardon all outstanding punishment tools and confinement period of the upperclassmen, Class 2019, 2020 and 2021 of the Cadet Corps of Philippine… [applause] Effective today, 21st day of March in the year of our Lord, Camp General Mariano Castañeda, Silang, Cavite.